The Honourable Minister of Health, Prof Isaac Adewole on Wednesday embarked on sensitisation and education of voters on how best to cast their votes in order to avoid their votes being voided during this Saturday's general elections. 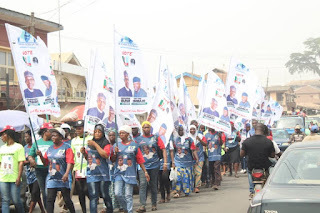 The campaign team of the minister under the aegis of Buhari Leekansi Initiative stormed IjesaLand , to re-strategize on the best way to reach out and sensitize the electorate especially at the grassroots level on the need to vote wisely and not succumb to tricks by greedy and desperate politicians, whom they said have brought the country into mess before the inception of the present administration of President Muhammadu Buhari. He urged the people of the area on the need to come out en-masse and cast their vote for President Muhammad Buhari, his Vice, Prof Yemi Osinbajo and all APC candidates in the February 16 and March 2 elections. Adewole charged them not to sell their votes and conscience for any mount of money. According to him, "we embark on the sensitisation and enlightenment campaign in other to tell our people that they should adjudge the administration of Buhari as an administration that have deliver and that will continue to deliver. "We are using this opportunity to educate electorate to use their index finger to cast their votes diligently and they should ensure they do not allow the ink to spill over to other boxes." However, it's a veritable platform through which the campaign of the second term bid of President Buhari is channelled so as to complement the APC campaign structure in four selected states, Osun, Oyo, Ondo, and Ekiti in the South West states. 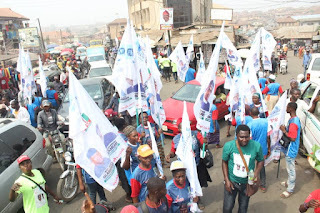 The team who had visited Iwo and Osogbo, Olorunda, Ife North, Ife East, Ife Central, Ede North, Ede South local government areas returned to Ilesa and Ijebu - Ijesa on Wednesday to a tulmutous crowd of party supporters and well wishers in solidarity and to endorse Buhari for second term.